Viet Yam – Yam is right! In the centre of the Foodhallen, you will find your one-way ticket to a Vietnamese street food market. 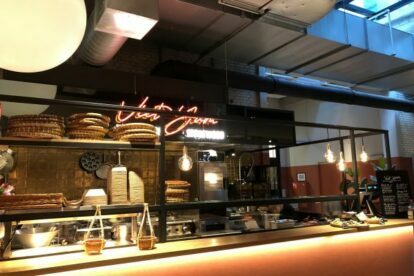 Viet Yam started as a food truck bringing their flavour infused goodness to the masses, and now Rotterdam currently holds their only fixed location. The sharing platter is one of the most seen around the Foodhallen and for good reason. With sixteen pieces of a combination of their dishes, it is truly a treat. Personally, I cannot go too long without the Banh Khot: savoury mini pancakes with shrimp, herbs, coconut and served with salad leaves and a dipping sauce. Rolling the pancake in the salad leaf, dipping it in the sauce and experiencing the explosion of flavours that makes you close your eyes and just savour the moment is something you need to gift yourself. The beef Pho Roll is another flavourful take on a Vietnamese favourite. There are a variety of flavours to choose from for your spring roll fix (including vegetarian) and any choice will have you smiling. You cannot have Vietnamese street food without Banh Mi on the menu. The Banh Mi tastes authentic and yum. The menu will be expanded with new dishes in the near future, including soups, hearty meals and add-ons to the spring roll choices. I for one simply cannot wait for my sure to-be new favourite dishes.